Product Detail Summary: The 911 GT3 RS has an incredible 300 horsepower-to-tonne ratio and capable of a top speed of 193 mph, more than enough muscle to chase down the bad guys and bring them to justice. 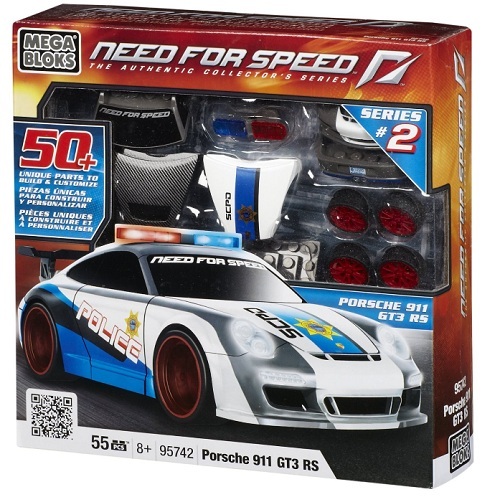 The Porsche 911 GT3 RS is painted in black, blue and white police colors, decals and emergency lights. Customize your Porsche 911 GT3 RS by Mega Bloks with cool interchangeable parts like an alternate black hood or swap your emergency lights for an undercover street roof to make your ride truly unique. Build, play and display your Porsche 911 GT3 RS for the whole racing world to see. Do you have the Need for Speed?Ideal for car buffs ages 8 and up.